Be the first to share your favorite memory, photo or story of Jorge . This memorial page is dedicated for family, friends and future generations to celebrate the life of their loved one. 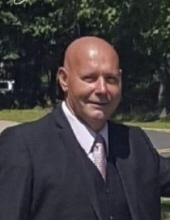 Jorge Manuel Da Silva Ramos, 59, passed away at his home in Newark, on Sunday, November 25, 2018. He was born in Murtosa, Portugal and came to the United States in 1966 and resided in the Ironbound Section of Newark, NJ. Son of the late Joao Augusto Henriques Ramos and Maria de Jesus Vieira Ramos; loving father of Stephanie Ramos-Martins and her husband Bruno; brother of the late John Ramos. The Funeral Service for Jorge will be offered on Saturday, December 8, 2018, at 11 am at Holy Cross Chapel Mausoleum, North Arlington, NJ. Relatives and friends are welcome to attend. In lieu of flowers, donations to the family thru the Venmo App, Stephanie Ramos @Stephanie-Ramos89, would be graciously appreciated. To send flowers or a remembrance gift to the family of Jorge M Ramos, please visit our Tribute Store. "Email Address" would like to share the life celebration of Jorge M Ramos. Click on the "link" to go to share a favorite memory or leave a condolence message for the family.